We all have a goal of losing weight or at least staying in shape. Tyson Grilled & Ready and Hungry Girl have teamed up to coach women through the first 30 days of January via the newly launched “30 Days, 30 Ways, 30 Rewards” program, offering recipes and lifestyle tips using fully-cooked, lean Grilled & Ready products. Everyday you’ll find a nutritious and quick recipe for dinner, a clever tip, and a chance to win some exciting prizes. I love that a great product has paired up with a great foodie. Tyson Grilled & Ready is a staple item in my house. I get to feel like super mom who slaved over dinner, when in reality I opened a bag and the meat was ready to go for our entree. I’m excited to learn a ton of new recipes to use these with over the next 30 days! 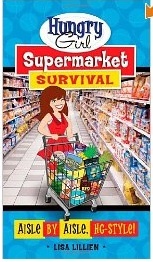 To get you excited, Tyson is giving away a few copies of The Hungry Girl’s new book, Supermarket Survival and coupons for FREE bags of Grilled & Ready Chicken! They also sent me a copy of the book (and a coupon) so I could check it out. She has some great tips, going through each aisle like helping to breakdown exactly what the difference is between “reduced fat” and “low fat” in the dairy aisle. Or what fat-free cheese melts the best for cooking. There were a few things that I already knew, but I still loved the reminder. Set mini goals for yourself. Don’t take on challenges that are impossible. Setting out to drop 20 pounds by February is not realistic and isn’t safe. And don’t expect to run a marathon if you’ve never jogged a mile. Make small changes, like drinking more water, filling your plate with lots of veggies, walking more often, and keeping track of what you eat. Soon these habits will become second nature, and you’ll experience results at a healthy rate. Let yourself indulge a little. It’s okay to splurge on foods that aren’t “diet-friendly” once in a while. (I can’t resist the pretzel bread at one of my favorite restaurants.) Just get right back on track. Don’t let a weekend splurge turn into an excuse to overdo it all week! Tyson is giving 4 Southern Savers readers a FREE copy of Hungry Girls Super Market Survival Book & a coupon for FREE Grilled & Ready Chicken. Leave a comment with your own unique tip for keeping your new year’s resolution or a favorite meal you love to fix with Tyson Grilled & Ready chicken! For an extra entry like Tyson & Southern Savers on facebook. Leave a comment that you did. Winners will be chosen Friday 1/20. As a busy mom, I LOVE Tyson grilled and ready chicken. We make linguini noodles, use a jar of alfredo sauce and Tyson grilled and ready chicken and steamable broccoli frozen bag as toppers and in about 15 minutes we have a meal that looks and tastes like we got take-out from the Olive Garden…. Thank you Tyson, you are a small part of making my life easier!!! After I accomplish a goal, I reward myself. I do little things such as getting my nails done or buying that purse I have been eyeing. My husband also rewards me by watching the kids and letting me have time to myself. I would use it on a great salad, maybe w/ an Asian style dressing. I love to use the Tyson strips in my Weight Watcher friendly Caesar Salad! don’t just write down your resolution- post it in a very visible location! grilled chicken…great to add to your salads! My new years resolution is to eat healthy and stay fit. Aside from planning into doing some exercise plans in a daily basis, a new set of healthy food should be prepared. It is always fun to do something new by including your husband in the game. So now, both of us ( me and my husband) is starting our new year with grilled chicken, fish and of course vegetables. Less on carbs and more on proteins! I would love to have this tyson grilled chicken for dinner! I like to use the grilled chicken with jarred alfredo sauce and frozen broccoli for a fast meal. I track everything I eat and keep a food journal! It helps me to stay on track and manage my weight loss! I love making fajitas with Tyson chicken. Quick and easy! I am currently working, and going back to school. Tyson grilled chicken is GREAT, fast, healthy option for me when my time is consistently limited. Thanks so much!! working mom needs easy to fix and nutricious meals – thanks heaven for Tyson’s! often a dinner saver at our house! Keeping a food journal. It helps you see exactly what you are eating and what changes you may need to make. It also holds you accountable for everything that goes in your mouth!! It’s pretty simple, but I love using the tyson strips in a quick wrap with lettuce, cheese, and low fat ranch. Can’t get any easier than that!! One little tip I use is keepin my teeth brushed so i don’t go overboard snacking, i love having the fresh brushed taste and its better than potato chip taste later in the day. Also i don’t have tons of time to keep running and brushing my teeth if i do break down and snack, so its a good deterant to help me not snack so much. And i like you on facebook! I “liked” Tyson’s Grilled and Ready! Oh and I already “liked” Southern Savers, does it still count? Tyson grilled and ready chicken is one of my favorite products! My main advice for anyone trying to live more healthfully is to not beat yourself up if you mess up one day. You can;t expect perfection right out of the gate! Also, don’t measure yourself by anyone else’s progress. I would use the Tyson grilled chicken on salad with low calorie dressing on the side. Tyson grilled chicken makes meal time easy! My unique tip for keeping my New Years resolution would be to TALK ABOUT IT with friends and family. By telling those around you what you want to accomplish you will gain support and have a place to go when you feel like you cannot achieve your goal. Your peers know what you are trying to do and they can offer help or advise if you are feeling defeated. A support system is the most beneficial thing you could possibly have! I used tyson grilled & ready chicken to fix taco salad………I use tortilla wrap and spray cooking spray or rub olive oil over the outside and base of a ceramic soup bowl and then I press and mold the wrap over it and put it in the oven for about 10 mins. and then you have your taco. Quickly heat your chicken strips up and put them in the bowl…..top with lowfat mexican mix cheese; shredded lettuce, tomato, lowfat sourcream; and salsa. IT IS SCRUMPTIOUS AND VERY FILLING!!!!! I save my calories for things that are really good. For example, I won’t eat a half-stale donut or keebler cookie, but WILL indulge on occasion on a freshly baked oatmeal raisin cookie. Even then, I will probably split it and share half with my husband or mother. The point is, I make sure I’ll really enjoy it (many times just a taste will do) and aren’t just mindlessly eating or doing so because I’m bored or stressed. Would be great with a grilled.chicken salad or even a.fettucini Alfredo! Yum! Liked Southern Savers on Facebook. I love using these in salads!! I liked tyson grilled and ready! I sneak in veggies when I can – I like to make Chicken & Veggie Pita Pizza: add pureed carrot or squash to pasta sauce, put on top of whole wheat pita, then top with chopped up grilled chicken, onions, olives, peppers, spinach, mushrooms, and reduced fat cheese. Perfection! I. Liked SS on FB! They make a quick chicken fahita dinner!! LIked on facebook. I hope I win. My tip is start with easy changes that make a difference: drink 2 to 3 cups of green tea a day, drink a BIG (24 oz) glass of water (I add Simply Lemon to make it yummy) each day, grab almonds or fruits for snacks, eat Greek yogurt for breakfast, flex your tummy or do leg lifts while sitting at the computer, etc. Little things actually change your brain and get you on the right path for making bigger changes! I make sure to have an accountability partner that I can check in with — often one with the same goal as me. Team up with a friend or friends to exercise…it has really worked for me. Not only am I accountible to them, but I go farther and faster than I would ever go on my own! A tip for not eating the wrong things is to not buy them and put them in the house in the first place. Since you eat what’s on hand if the unhealthy, fattening foods are not in the house you won’t be as likely to eat them! I like to cut up warm pieces of Tyson grilled chicken and put it in my salad. Yummy! I like to have an accountability partner – when you have someone to report to it makes you more motivated to do what you were supposed to do! I love chicken & broccoli casserole! Break goals down so that you pick up one additional small habit or change a week. This way, all of the lifestyle changes that you need to make aren’t overwhelming! I like SS on Facebook! I love to make a chicken Ceaser salad with Tyson Grilled and Ready Chicken…so easy and so good. My tip is simple, take a moment to look at my kids, they are a constant reminder that I need to keep my resolution to get healthy so I can be with as long as they need me and then some. I have made a commitment to lose 92 pounds this year and I use the Tyson Grilled and Ready chicken on my salads everyday for lunch! It tastes great with spinach, sliced tomatoes, the grilled and ready chicken and feta cheese! I “liked” Southern Savers on Facebook!! If you mess up just start right back…don’t tell yourself you will start back tomorrow, because it will just keep turning into the next day. Love tyson chicken in salads….so easy and healthy! I liked Tyson and Southern Savers on Facebook. I love to make salads and wraps with the Tyson Grilled and Ready chicken. So much more convenient than having to cook a breast of chicken just for a salad. I like to make chicken fajitas with Tyson grilled and ready chicken for a quick meal. My husband and I are very competitive. We make it a game. Who can keep with it. Neither of us want to be the loser. Also liked Tyson on FB. I like both Tyson and you on FB as Bella Jewel. It sounds like the perfect solution for a quick chicken caesar salad! I keep a bag of baby carrots or some jello in the fridge when I get the urge to have something sweet to snack instead of grabbing high calories sweets!! To keep me on track I measure and weight out all my food. It keeps me honest and helps me know what a serving size really looks like! Everyone in the office is working to eat better and go to the gym. We keep each other in check. I love this chicken with onions and peppers to make a stir fry. perfect additrion to salad for a mid afternoon snack! Liked both southern savers and tyson on Facebook! walking walking walking…..every day…..no excuses! I like Tyson and SS on facebook. I get up and move during commercial breaks, walking in place, crunches, tidying the house, etc. I like Tyson and Southernsavers on Facebook! To keep my new year’s resolution, which is to exercise and lose weight, I set up small rewards before I started. That way I am rewarded when I reach a small goal and that keeps keep me motivated along the way. My “go to” advice to to start small and be consistent! I also like the idea of finding an outfit you want to fit back into and hanging it up in plain sight. It gives me a visual goal and makes me think twice before eating something that I might not really need! one of my favorites with the tyson grilled and ready chicken is to add it to a salad and have a quick chicken salad. another option that isn’t as healthy is to put it in a skillet for a few minutes with some peppers and onions and spices and have fajitas-yummy! To keep my New Year’s resolution I remind my self regularly that I am not on a diet but making a life style change. I also liked Tyson’s and Southern Savers on facebook. My resolution is to lose weight before my vacation in March. To inspire me to keep it, one of my favorite “skinny” dresses is hanging in the kitchern. I have to look at it every time I go looking for a snack. I liked Tyson on FB and I LOVE this chicken! It tastes great and helps me get a good, nutritious meal on the table in under 30 minutes!! To keep my new years resolution I have removed all junk food from the house and when I get home wiht produce I celan and cut it right away for quick snacks. At our house we love the Grilled & Ready chicken on salads… it is so much tastier and better for you than pre-sliced deli meat. Our favorite fast and easy meal is G&R chicken on a salad with FF dressing. I don’t “do” resolutions anymore (way too much pressure). I simply make the best choices I can every day. Today I’m eating more meat and veggies and staying away from processed foods. Grilled chicken fits that menu! love tyson ready grilled on my salad! our new years resolution is to eat healthier. “diet” is a 4 letter word! I use pinterest to find new appetizing healthy recipes to try. Me and my husband are trying to lose weight together, which helps, and we actually bought a couple of bags of these Tyson grilled chicken breasts this weekend. We’re trying to not eat as much bread and pasta and grilled chicken instead of breaded…things like that. We are making bets to help encourage us and this month the bet is whoever loses the most don’t have to get up with the baby for a week (we have a newborn). So hopefully we can do it together. My favorite tips is using ready made products that are already low in fat and calories, like Tyson’s Grilled and Ready! My favorite meal along with my son is Chicken Quesadilla! First get a spray your skillet with a low fat spray or olive oil, then add a whole wheat tortilla, then your sliced up Tyson Grill and Ready chicken, add low fat or 2% shredded cheese, any veggies you like and you can omit the cheese if you like (but it help holds it together) then add another wheat tortilla to the top and let it warm thru out to melt the cheese to the top and then flip it over for another few min and then it’s Ready!! You can then add a low cal/fat salad to the side or top it with fresh salsa and low fat sour cream and this is delicious and a will a big hit with the whole Family!! I’ve never tried the chicken before, but I would probably do a version of cheesy chicken where I melt a slice of provolone on top of a chicken breast and put cooked onions and green peppers on it. I love making fajitas! I put different toppings all the time leftover veggies, dressings, lettuce tomato, onions, cheese…..yum!!! It’s a great lunch or light dinner! I SO want to win this! I just started using the Tyson Grilled and Ready chicken and it’s really good! I use it in any chicken casserole, in a salad or just by itself with vegetables on the side. Really easy and very good! I liked both Tyson and Southernsavers on my FB in addition to my favorite recipe using grilled chicken below! I liked Tyson Grilled and Ready on Facebook…..I already liked southern savers! Trying to do a low fat and low carb diet for a better life for myself my husband a four kids. The precooked chicken is a great way to keep me away from the fast food window while working night shift! I love this chicken because I’m pregnant and sometimes too tired to prepare a healthy meal from scratch. I use the chicken over a salad, steam some vegetables on the side, or put it in a wrap with lettuce and cheese. YUM…I hope I win! Everytime I go to restroom at work I do 5 lunges. That helps at least a little on exercise. My resolution: eat more healthy choices. Instead of drinking diet soda I’m making green tea with splenda and not purchasing soda. My secret to keeping a new years resolution is setting several little goals instead of one big goal. My first goal that i have set and reached is lose 5 lbs… And i did!! I would love to make chicken fajitas! Love them. I always “like” SS. My tip – don’t ever give up! To keep my resolution I do a couple of things. First, I have pictures around of what I want to look like; after having 3 kids in 5 years, these are pre-preggo pics of myself. I also have pictures of me with the extra weight around so I can see where I currently am. Finally, I reward myself for achieving small goals with something non-food related. I’ve also set a goal for myself to run a 5k to get in my exercise time. I try to fidget while I am in the kitchen. Cooking and cleaning can add any where to thirty minutes to an hour to my day. If I wash dishes I try to side leg lifts or squats. This all adds up to your daily exercising. Tyson makes my days easier! Working out is tough so I set goals and have a workout buddy who helps me stick to them. We also adopted a couple of dogs so they give the whole family a workout while chasing them! I also liked Tyson and Southern Savers on FB! Hoping to win! My husband and I eat these all the time!! I struggle with exercising regularly. The only way I can keep myself going is to let myself watch my favorite TV show only when I’m on the bike or treadmill. I won’t let myself watch it unless I’m exercising. Its been my plan for over a year and its working so far. Just don’t even buy the non healthy snacks. Make sure to have lots of healthy things to snack on around. There are lots of options to choose from that are healthy and yummy. I love a good salad with the chicken on top! 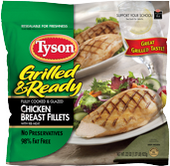 Tyson Grilled & Ready is perfect for completing salads for my lunch and my daughter’s lunch. She also likes the meat in her roll-ups. Also, love that it keeps in the refrigerator for a few weeks!!! i don’t buy potato chips, i can’t eat them responsibly! with three kids all doing basketball, 1 of them doing wrestling & starting baseball, 1 of them doing travel softball, me working full time and my husband owns his own auto repair and tire store which I help him with, Tyson grilled & ready to serve is all I have time for. Plus it is healthier than frozen pizza. I also liked them on facebook and of course Southernsavers too!!!! I also liked Tyson and Southern Savers on FB! Eating more veggies and fruits each day is tough. But, the Grilled and Ready chicken makes it way easy to throw a salad together for a quick lunch and get some veggies taken care of! I have liked both pages. A good tip for keeping resolutions is to start out slowly. We made several resolutions this year and have started doing them in phases. It makes it a lot easier. I am not into exercising but this year I have been copying my kids at the playground for a hour a day, big workout considering I have 3 to keep up with. Our most fav din din is chicken fajitas using the Tyson chicken yum yum. Just start small, I need to get back to working out. My goal is to work out for 15 min. Once I do that for awhile, I’ll go up to 30 min. I “liked” Tyson on facebook. Keeping it fun, by signing up for classes like Yoga and going running with my husband! I started taking karate with my kids, we do it together and encourage one another. I liked SS and Tyson on facebook. Grilled chicken plus onions, mushrooms, or your favorite veggie + barbecue sauce + pita or flatbread + oven for 10-15 minutes = yummy lowfat bbq chicken pizza! I’m up early so I try to go ahead and exercise before the craziness of the day begins. using my fitness pal to keep track of everything! I have an accountability partner. It’s hard to quit when you are going to let someone else down. For resolutions, I think agree you need to be more specific. For instance, I can only dine out 1x per week and I aim to go to the gym 3x per week. Just doing the more specific goals will lead to the greater goals of losing weight and getting healthy. I have pictures of my husband and son on the refirgerator! Knowing that they are cheering me on in my goal to lose weight and get healthy is all the inspiration I need! They are also getting healthier in the process! Shhhh…don’t tell them though! My co-worker and I are both trying to lose weight and eat helathly, so we have been walking for exercise and eating salads! We love our salads topped with Tysons grilled and Ready chicken! We love them, most recently we made soft chicken tacos with them. Very yummy. I eat breakfast everyday, be it a banana, yogurt or dry cereal. I liked Southern Savers on Facebook a long time ago! Chicken stir fry is one of our faves! (and I often forget to thaw the chicken – D’oh! so I’m scrounging for something else at 5:00). I’d love to try the chicken and LOVE Hungry Girl!! Some of my friends and myself joined the ymca. Even when I want to be lazy like today since it’s raining, they call me and say we have to do it. So let’s go work out and get healthy…..
i am drinking more water and feel GREAT!! Tyson Grilled and Ready Chicken – My favorite is to use the chicken on a baked potato bar where we invite lots of friends over to enjoy time together. We bake the potatoes, place them in a warmer, and each person that comes brings a topping that will go on the potatoes. I always volunteer to take the grilled and ready chicken! I like Southern Savers on Facebook! I intend to drink more water this year, so to help me stay on track I add a 1/4 of a fruit juice to my water to encourage myself to drink it all, and have a few more glasses. So far so good! I “liked” Tyson and already “liked” SouthernSavers months ago. Thanks for helping people like me with this. I forgot to leave my tip for NY’s resolution…I have resolved to stop buying cookies and other sweets, even when on sale! It is too much of a temptation. Also, exercising with a buddy keeps me accountable! I am trying to exercise 5 days a week – even if it’s only for 15 minutes – some is better than none!! love the tyson grilled chicken on a huge salad, trying to eat more salads this year and also limiting my out of control night time snacking to ONE snack a night. I love the Tyson Grilled and Ready chicken and will use it to make Chicken Tacos, Chicken Tetrazinni, Teryaki chicken – really for anything. I love just having that chicken on hand for when I want a quick, easy but filling salad. Yum!! I use Tyson Grilled Chicken Strips for EVERYTHING! I don’t cook (outside of the microwave) and it’s a nice change from frozen dinners. My favorite uses are making my own burritos and/or a chicken Caesar salad. I’ve “liked” SouthernSavers for a long time and today added Tyson. My tip is that I tell my young children (6 and under) that my resolution is to go to the gym each day while they’re in school. This keeps me accountable, because I may let myself down, but when they ask me if I kept my promise, I know I haven’t let them down! I lost over 100 lbs almost 20 yrs ago and have kept it off by enjoying Tyson Grilled and Ready Chicken. I really love how easy it is to heat and eat. I take one day at a time. It took me a while to get to this weight, it’ll take a while for it to come off. I eat Tyson Grilled and Ready Chicken with my favorite veggies and a salad! I’m trying to kick my Diet Pepsi habit and drink more water. I liked Tyson and SS on FB. I liked tyson just now!! I liked Grilled and Ready and Southern Savers of FB! My favorite meal with Tyson Grilled & Ready is chicken caesar salad! It doesn’t take any time at all to make, which is perfect for a family of 3 with two full time working parents! Tyson also puts out a lot of great coupons which makes keeping my “paid too much for it in 05” home a lot easier! I’ve only used the Tyson grilled and ready one time. I am looking forward to getting some new recipe ideas for them. I like taking the grilled chicken strips and make a salad with lots of veggies and fruit. I also use the raspberry viniagrette dressing. I love to use the Tyson Grilled & Ready to make a salad. My goal is to keep items that are healthy on hand so we don’t end up running out for take out at the last minute on a busy day when we are so hungry and don’t make the most health conscious choices. My husband loves cooking with these – his specialty is a low carb chicken quesadilla … he uses low carb tortillas and then adds taco seasoning to the strips and chopped onions on the stove top … then we all add the upgrades that we each want … cheese, sour cream, guac, etc… sorry we don’t have an exact recipe but that’s how we cook with the chicken strips! We just wing it! I like southernsavers on FB! My tip: I take one week at a time. I have been using a personal trainer to keep me accountable (I do pay for the services each month, so I better not waste it). I have gone 3 times a week for 6 weeks to the gym, and this is the longest, consistent work out schedule I have kept in years. Find something you love doing. That’s the only way you’ll stick with exercise. I liked Tyson on FB. We make healthy versions of things we are craving from restaurants.. last night we made chicken and cheese quesadillas! Yum! I liked Southern Savers and Tyson on Facebook! I keep the small York peppermint patties in my freezer for when I need something sweet. So satisfying you just need one. 1. Write everything and I mean everything you eat and drink down, including time and amount. It isn’t long before you decide to skip the chips just so you don’t have to write them down. 2. Wrok with a buddy. We love chicken and cheese quesadillas. My tip would be that I don’t create “New Years Resolutions”! You almost always set yourself up for failure! Instead I make life-style changes. If you change the way you live, think, act then you are 100 x more likely to break bad habits and in return create great healthy new ones! My tip is to keep the junk out of the house!! I do much better when the temptation is not here! 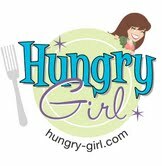 I love Hungry girl and have a couple of her books …I would love to win the new one! I have never tried this type of chicken but it sounds great and I would love to try it!! The most important tip is to be realistic about your goals and to eat a clean, well-balanced diet. I’ve been on Weight Watchers for over 2 years now, lost 94 pounds, and have been at goal for 15 months! You can do it, just believe in yourself! I love putting the chicken on salad and using newman’s own seseme ginger dressing! I like tyson on fb! My tip for staying with the healthy eating is to work out regularly . . . I never want to waste all that hard work! I make chicken fajitas with the grilled chicken. I liked Tyson on Facebook ! I already liked Southern Savers a while back. I track all of the food I eat with the LoseIt! app on my iphone. Works like a charm! I want to drink more water, so I fill up a water jug (65 oz) each morning. I have to drink all of it before I leave work for the day. I would love to win the book and like to use the chicken in salads! I use the Tyson chicken for quesadillas mostly but you can also use a marinade to make a sauce for a good last minute dinner! I keep a healthy eating and workout friend who keeps me in check. Eating at home more . A tip for keeping your New Year’s Resolution is to not get “stuck in a rut.” It’s easy to say “My resolution is to work out everyday,” but the same workout routine everyday can get tiring and boring. So it makes things more fun if you change it up. Maybe every other day do cardio and lift weights on the days in between so you’re not stuck doing the same thing everyday. Another great example would be the “Eating healthier” resolution. Though it is cost effective to cook chicken in the beginning of the week then use the leftovers for your meals the next day, eating the same thing everyday can be boring, and sneaking those couple of cheese doodles in between meals becomes more tempting. I think the best way to stick to your diet is to change things up. Have chicken one day, then pasta the next, then maybe seafood the day after. Another tip is to allow yourself a “cheat day” Choose one day a month where you can allow yourself something to indulge in. Maybe you can get dessert, or finally give in to those cheese doodles. Just once a month, giving yourself a little “cheat” keeps your body from getting into a boring routine. New Year’s resolutions are not about solving HUGE problems….take baby steps so you can see progress and you’re more likely to reach your goal. I liked Tyson and Southern Savers on FB! i would love to make some wraps and some of my papmered chef recipes using tyson grilled meat as a time saver. so excited. I’d love a copy of the book too. pick me, please. I drink lots of water and fill a pitcher in the morning and add lemon, lime or orange slices to give it a refreshing flavor. The best way to keep your resolutions is to know that you’re getting healthy not just for yourself, but so that you can be the best you can possibly be for your family. After I had my son, my husband picked up Tyson Grilled and Ready Chicken. It was great with steamed veggies! My favorite dish we made was pasta and marinara sauce with chicken and cheese. So yummy! I am so thankful that we were able to have healthy, budget friendly meals that were super easy to prepare. I started training for a 30.1 mile hike in one day to raise money for CF. I have started to walk again. I also like Tyson on facebook!! I love quick fajitas for lunch or a wrap in just a few minutes .. TASTY!! My SIL is getting married and I have to fit in a strapless, cute bridesmaids dress .. MOTIVATION! I like Southernsavers and Tyson on FB! I set reasonable goals instead of resolutions. Resolutions sounds so… stern. Goals are achievable. My resolution is to make a weekly meal plan, where we don’t eat out. I love to use Tyson’s chicken to make enchiladas/burritos. Its so easy to mix up! I like Southern Savers and Tyson on Facebook!! I love the precooked chicken! My favorite thing to make is peppery chicken alfredo! I like southernsavers and tyson on facebook too! Lost 30 lbs last year…goal 20 more this year….I eat alot of Tyson chicken strips….stir frys.lots of peppers onions and mushrooms…I could eat my weight in mushrooms!!! !Yum…Chicken strips with fruit pineapple really good.. I would love to use this chicken for fajitas or a salad. Since my resolution is to lose at least 10 pounds before Easter, this item would be a great asset in helping me reach my goal. I like Tyson and Southern Savers on facebook. I love the tyson grilled & ready chicken with mashed potatoes and green beans. Its quick and delicious. I liked tyson and southernsavers. They are the best sites to use. I started replacing skim milk with unsweetened vanilla almond milk. I use it in cereal and oatmeal. I love making fajitas with Tyson’s grilled and ready chicken. It is delicious and easy! Tyson’s grilled and ready chicken on a salad of greens, cucumber, toasted almonds and cranberries, with a Light Raspberry walnut or Balsamic Dressing! YUM!!! I like to make quesadillas – chicken & cheese, yum. I “Liked” both Southern Savers and Tyson’s on Facebook! One of the things that helps me stay on track is to write down what I am eating during the day. Also planning out a weekly meal schedule keeps me from getting frustrated at dinner time. I know exactly what I am going to make and keeps us from eating out. Love the convenience of the Tyson chicken breast. I received a Body Media Fit for Christmas to help me stay on track this new year. The Body Media Fit keeps track of all the calories I burn during each 24-hour period and then I input the calories I put in. This really helps me stay on track because I can actually see calories in and out. I love it! I plan meals in advance. That way I’m never in too big of a hurry and don’t have to rely on a fast food meal. This also helps for knowing if I should eat a lighter lunch if dinner is going to be a little higher in calories. One of the best things I have used to help me, is to put a picture of yourself when at the weight you need to be on the refrigerator AND one of you now on your bathroom mirror. A picture says a thousand words. Good luck to all that are aiming for a better, healthier life in 2012. School lunches were a major problem for me. I love school lunches! Istarted taking my lunch so I could cut down on caloies. I have started making wraps with the grilled and ready chicken. On January 8th I began a journey to become healthier and have set a short term goal of losing 50 lbs (I have about 100 to lose). So far I’ve lost 6 lbs. I workout at home and my favorite weight-loss tip is to choose a TV show (or shows) to record on the DVR and ONLY allow myself to watch those shows WHILE working out. I am sure to make it something I really love and don’t want to miss and not only does this give me incentive to workout (other than losing weight and being healthier) but I get excited about working out so I can see my favorite shows, I don’t procrastinate when I’m anxious to see “what happened” on the show and it associates something positive and fun with my workouts which makes me look forward to working out and the time just speeds right by while doing so! I started planning my meals around what is on sale in the produce aisle and in the meat department (poultry and lean meats). Trying to save money, lose weight and stay healthy! I love using the grilled and ready chicken to put in a salad for lunch. Quick, easy and healthy! That is my go-to brand of chicken for a quick dinner! I pair it with some veggies and I’m out of the kitchen in 10 minutes! I like southern savers and Tyson on fb! We have cut back on our eat intake by eating more beans and veggies…one time a week helps me cut out those meat and potato meals my husband was used too. I would love to do this but I don’t have a facebook account and I don’t want one! I’ve never tried tyson grilled and ready, but would say the best tip I go by to keep a new years weight-loss (or maintain) resolution is portion control. I love grilled and ready! I am currently pregnant with twins and my husband on a diet!! lol so this is good and quick for us. Since I work full time I can come home and have supper done quick! My resolution was to be healthy and I knew couting ever calories, point, or carb would get old so fast. I decided to cut out a lot of our eating out to help ur whole family be more healthy. As a very busy working mom I found products like Tyon’s Grilled and Ready make it super easy for me to feed my family a healthy meal in a hurry! I warm as directed and added two veggies or a veggie and salad for sides. In the last year, I cut back on my calorie intake and drink lots more water and have dropped 45 lbs. My motto is the only way you are a failure is if you quit! If you had a bad day and ate the whole house, that is ok. Get back up and keep fighting! I like tyson and southernsavers on FB. I am saving money and helping my family to be more healthy by meal planning. We are definitely trying to eat more veggies and low fat proteins! To keep my resolution to drink more water, I realized that if I keep lemon juice and just put a little squeeze in slightly frozen bottle of water I can go the whole day without drinking my soda’s I Love So Much! I went back to work this year and tyson grilled and ready has helped me when there hasn’t been a whole lot of time to cook after work. I love to make Fajitas with them and I also use them in salads that I take to work with me. The kids and my husband love them justt as much as I do! lots of sleep and eating breakfast helps my metabolism I eat eggs high protein sift boiled keeps me from getting hungry or high fiber cereals. Add more porotein to your diet and drink only water. Eat more foods with fiber to help you feel full longer. My tip for keeping your resolution is to keep a journal or diary. My best tip to keep weight loss/fitness resolutions is to use myfitnesspal dot com! I lost 80 pounds using that website to track my food and exercise. Then I gained 40 pounds during my pregnancy so I’m back there to lose the baby weight! My tip is take a picture of yourself before you start your diet and after you’ve reached you goal. It might make you think twice about eating something again. We LOVE grilled chicken salad with Tyson Chicken. It’s a big hit around my familys home and now mine! I liked Tyson on Facebook. My son loves a lower fat version fettucine alfredo using lowfat cream cheese, chicken broth & Tyson grilled chicken. Yum! I like to use the Tyson chicken over a nice salad for a hearty lunch. I would love to try making some chicken tacos with Tyson grilled chicken! I love wrapping the grilled and ready strips in a tortilla with some veggies, cheese and ranch dressing for a quick lunch! I enjoy cooking and especially trying new recipes, so I’m trying to eat better this year by finding recipes that put a tasty spin on healthy foods that I typically find bland (squash, avocado, etc.). I love to make a chipotle salad with Tyson’s grilled chicken strips. All you need is lettuce, tomato, onion, chipotle seasoning and a dash of olive oil. I like southernsavers on facebook. I like Southern Savers and Tyson on Facebook. The possibilities are endless with the Tyson Grilled and Ready Chicken! I”m a SS fb fan! I love to make delicious chicken fajitas with the Tyson grilled and ready chicken! I cook onions and red & green bell peppers in the skillet with a little olive oil and add the chicken with a few spices! They are the best! I also follow Southern Savers & Tyson on Facebook. I love to make salads and use the chicken as a salad topper, especially in summer when fresh fruits and veggies can be added. I liked both on Facebook, thanks for everything Jenny! We use ready cooked chicken for stuffed pitas topped with lots of veggies and chipotle sauce… Yummy! I like to use tysons Chicken when I make my BBQ Chicken Pizza! I am a Southern Savers FB follower! I park far away from the store and walk. Love to make quick chicken alfredo with Tyson. I love to make chicken wraps with the tyson grilled chicken! Add lots of lettuce and tomato and it is delicious for lunch! I love to make chicken Alfredo with Tyson Grilled and Ready chicken strips! I made a resolution to get moving and to write down EVERYTHING I eat so I can make changes as necessary. This first week I lost 4 pounds! I made sure to “like” Southern Savers and Tyson on facebook so I can get more ideas to eat healthy and lose more weight! I love Tyson grilled chicken with zucchini, squash, olive oil, and South Beach turkey sausage – all lightly mixed together in pan on angel hair noodles. Make my resolution realistic and treat every day as the first day. Yummy, Healthy chicken quesadillas. Mix Tyson grilled chicken strips with your favorite fat free salsa, taco seasoning and shredded 2% mexican cheese blend. Add peppers and onions if you like to mix. Spoon desired amount on to a large whole wheat quesadilla. Fold in half and cook in non stick skillet until warm and cheese melts. My kids love them. Enjoy!! I cut it up and use in pasta salad along with fat free Italian dressing, reduced fat parm, black olives, & whole wheat pasta! I likeTyson chicken on fb! My goal is to eat more lean meats and reduce sugary desserts. I like that the Grilled and Ready is a quick and nutritious way to accomplish this. This would go great with brown rice and steamed veggies. Drinking lots of water when I feel like picking at something! I like TYSON & SOUTHERN SAVERS on facebook. I like Southern Savers and Tyson Grilled and Ready Chicken on Facebook! I actually had the Grilled and Ready Chicken on a salad tonight for supper! YUMMY!!! I liked Tyson Grilled and Ready on Facebook, and had already liked Southern Savers on there a long time ago. I like to fix green chile chicken enchiladas with my Tyson Grilled and Ready chicken. We have a Hungry girl Cookbook that we have used now for several years, great recipes. Our Second Grandson is due next month, this comes at a great time, Thank you! liked tyson on fb. Already like SS. I like to eat Tyson with some brown rice and lentils. Yummy and protein rich! I like Southern Savers and I like Tyson Chicken!! I use it on salads and sometimes for Quesidillas too. To cut back on in between snacking, I try to drink more water! I would love to win the book and coupon, too. Friend are very important to weight loss. They keep you on track. I just “liked” tysons on facebook. I have been a friend of southern savers on facebook. When I feel hungry I drink a cup of green tea. No calories, lots of antioxidants, and my stomach feels full. Write down everything you put in your mouth. Those little nibbles add up! Make sure I schedule in time for exercise throughout the week. I love using the grilled and ready chicken in so many dishes! My recent favorite is to sprinkle the breasts with a little bit of homemade taco seasoning, a small amount of sharp cheddar, and serve over beans and rice. It’s a tasty, affordable Mexican meal! I along with 4 other friends joined a gym… We all meet at 5am to work out together… If I decide not to go, by 5:05 I will receive 4 phone calls. Accountablility!! I meet my friend at the gym several times a week. I drink water during the day and try to pick healthy snacks. We love grilled chicken and grilled vegetables for dinner. But with busy schedules sometimes there is no time to prepare them from scratch. Tyson makes a great product that makes it easy to prepare a healthy fast dinner. Tyson grilled chicken with cheese, lettuce, and tomato wrapped in a tortilla makes a quick portable dinner. In order to keep my resolution of exercising, in some form, every day, I put a dollar in a jar every time I exercise. That way, at the end of the month, I’ll have a nice little stash for a new outfit, or pair of shoes! I would love to toss them on a Ceasar salad! I add it to my broccoli steamer bag with low fat cheese. Add it to my low fat spaghetti instead of red meat. I think mixing some of this chicken in with fettuccine alfredo would taste delicious. I am a follower of Southern Savers on facebook. I am now following Tyson on facebook. I like to start little by little each week in Jan with exercising first, then the next week start eating better, then the next week start eating more at home and stock up on better for ya groceries. My favorite recipe with Tyson Grilled Chicken is Chicken and Stir Fry Veggies over rice! Even my picky 3 year old loves it too! I love this chicken on a salad! The best way to keep your resolution is to take action! Plan to succeed! I also follow Southern Savers on FB! I am following Southern Savers and Tyson on FB. I love using the Tyson chicken on salads and in casseroles. THey make a great meal when you are tight on time. Also a healthy dinner choice for my daughter when she doesn’t want to eat what we are eating! I love using Tyson chicken with a dash of soy sauce and fried rice! Perfect Asian-style dinner! I have been eating healthy for about 10 months and chicken breasts are one of my go to staples! How wonderful that Tyson has these delicious grilled and ready fillets available for a quick protein snack to curb my hunger. But wait…they are excellent for lunch, too…just slice and place on top of your salad. Or maybe you prefer to eat it for dinner along with some steamed veggies. You just can’t go wrong with Tyson! I love to make chicken tacos with the tyson grilled chicken. I like SS and Tyson on FB. The only way to stick to it is have the whole family eating good! My tip for keeping my resolution to lose weight: post your current goal in a place that it is regularly visible to you. My first goal is to lose 5 pounds, so I drew a big 5 on a piece of paper and hung it on the fridge. Now when I go to get something, I see my goal and really judge whether I am hungry or just bored. To stay on track with my new year resolution, I like to keep a food journal and workout with someone with similar weight loss goals. I love the convenience and taste of Tyson grilled chicken. I use it in soups, salads, and wraps. I LOVE Hungry girl! The way to keep your resolutions is to have accountability…I tell everyone I know that I am watching what I eat. That way, when I am tempted to cheat at a meeting or meal, I know others are watching me! It “guilts” me into behaving! My husband and I love to use the chicken to make quick and easy chicken caesar salad pitas! I keep my resolution by making a list of one thing to do each day to keep my goal in sight. I keep my resolution in sight by tackling it first thing in the morning (the time of day I work best). My favorite recipe to make with Tyson Grilled and Ready Chicken is Chicken Pizzaolas (a Subway recipe). Super easy and delicious! My husband makes a modified fajita with the delicious Tyson Grilled & Ready chicken. Oh, it is sooo delicious! I have followed Southern Savers for several months on Facebook. I just liked Tyson on their Facebook page.